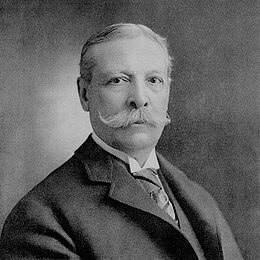 In our article about the Baghdad carpet we mentioned that it was sold to Mr Charles Tyson Yerkes (June 25, 1837 – December 29, 1905), who was an American financier. The lives of collectors like Mr Yerkes are often filled with adventure, misadventure and interesting facts that we, these days, seldom encounter and that make the art, such as the Baghdad carpet, that they collect even more interesting. Mr Yerkes is a very interesting character. He played a major part in developing mass-transit systems in Chicago and London. When Charles Tyson Yerkes decided to leave Chicago for New York City in 1895 he had everything he wanted—a staggering fortune and successful career as a financier and street railroad titan. Three years earlier he had donated nearly $300,000 to the University of Chicago to build the Yerkes Observatory in Wisconsin which included the world’s largest telescope. The only thing he could not achieve was acceptance into high society. Yerkes had started out in the brokerage business in Philadelphia, where he also began developing traction and street railways. As his fortune increased, the married Yerkes noticed the 16-year old Mary Adelaide Moore. Mary, called Mollie by her friends, was one of nine children of a chemist and before long was Yerkes’ mistress. Charles Yerkes was more ambitious than scrupulous and in 1871 was sent to prison for embezzling $400,000 in city money. His teen-aged mistress faithfully visited him there, earning her the nickname “prison angel” by the prison officials. Yerkes discovered upon his release that both his and Mary’s reputations among society were irreparably ruined—he was seen as a scoundrel, she as a home wrecker. He divorced his wife and in 1880 took Mary to Chicago where they married. Mary failed utterly as a hostess, partly because of Yerkes’ merciless business tactics. By 1896 when the Yerkes New York mansion was nearing completion at No. 864 Fifth Avenue the robber baron had taken a new teenaged sweetheart. Emilie Grigsby was exactly the age that Mary had been when he met her—just sixteen. When Yerkes and his wife moved to New York, Emilie would not be far behind. The two-story entrance hall, like the vestibule, was completely constructed of marble. “Just beyond the door are two columns with pilasters of rich purple marble, with Ionic capitals of white marble and bases of Istrian marble,” as described by Barr Ferre later. Yerkes apparently felt that marble was reflective of success and taste and even the Drawing Room was clad in the stone. “The walls, from floor to ceiling, are wholly encased in Cipollino marble,” said Ferre. The grand marble staircase rose to the second floor loggia and “serves as a monumental approach to the Italian Palm Garden,” wrote Ferre. “It is a spacious and delightful place, having the true character of an indoor, or winter garden…All of this interior is of white marble, save the cornice, which is copper.” As with most lavish homes of the 1890s the Yerkes mansion had period rooms. The Music Room was Louis XV in style with frescos by Will H. Low. The Dining Room was Elizabethan with highly-carved quartered oak walls and a vaulted ceiling. There was an East Indian Room, an Empire Room, and a Japanese Room—a near requirement of the time. The Library was finished with antique 16th century panelling. The main bedrooms, dressing rooms and bathrooms on the second floor were sumptuous. The fireplace of the Charles’ bedroom was black onyx and the “adjoining Dressing-Room is trimmed with rosewood and has a gold-leaf frieze and ceiling. His bed had once belonged to King Ludwig of Bavaria and sat upon a dais with two steps covered in green velvet. The Bathroom has a polished marble floor and wainscot, above which is a gold frieze and ceiling with a silver cornice. The bathtub and basin are of marble and a shower is enclosed within a marble screen.” Mary’s oval boudoir was pronounced “one of the most charming [rooms] in the Mansion.” Her bed had belonged to King Leopold of Belgium. Below ground were the billiard room, a bathroom for guests, and the wine cellar. The walls of the billiard room were covered in leather with patterns formed by brass-headed nails. Although he had failed in Philadelphia and Chicago, Yerkes attempted to push his way into New York society. He dressed Mary in the most expensive fashions and jewels. But again she fell short. Wealthy New Yorkers already knew of their reputations and Mary’s heavy drinking and clumsy manners added to the problem. She made public scenes, once interrupting a play by loudly announcing that the “Lady Teazle” on stage was incorrect—the actress was wearing pink whereas a portrait in her husband’s collection proved that Lady Teazle wore yellow. Mary’s fury over her husband’s flagrant affair with Emilie Grigsby intensified when he built her a magnificent Park Avenue mansion not far away. The younger woman was banned from the Fifth Avenue house where Mary more-and-more lived in isolation. According to The Evening World, “Mrs. Yerkes barred her doors to Miss Grigsby the moment she discovered the truth, and the estrangement of husband and wife dated from that moment, although to the outer world they continued to appear as before.” While Mary drank and sulked, her husband collected. The house filled with irreplaceable artwork and statuary as he spent freely at the auction houses of Europe. The valuable items in the mansion were tempting targets for accomplished sneak thieves. One of them was the cultured and educated Elijah C. Harvey. The New York Times described Harvey on May 12, 1899 as “a mulatto, thirty years old, who is a graduate of an educational institute at Andover, Mass., and who afterward studied for the ministry.” As spring weather that year induced housekeepers to open mansion windows, Harvey took advantage of the opportunity. He would brazenly climb the brownstone stoops and enter the homes through the windows. On the morning of May 3 it was the Yerkes parlor he entered. For months the East 67th Street Police Station had been receiving complaints from residents of “a burglar who was making extensive depredations,” said The Times. 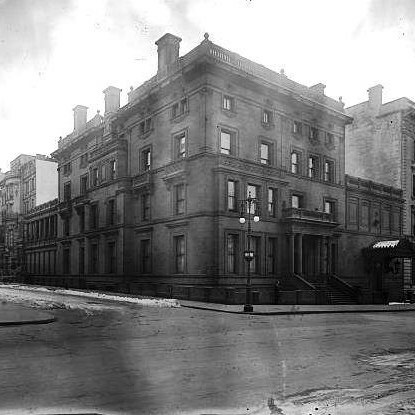 Just two days before the Yerkes break-in, the night watchman at the George Crocker mansion at 64th Street and 5th Avenue had nearly captured the crook. Now this morning housekeeper Mrs. Margaret Fitzpatrick walked into the Yerkes parlor just in time to see Harvey slipping out the window with a silver basket valued at $1,000. The openwork basket was easily identifiable; on one side was Mary’s monogram and on the bottom her full name: Mary Adelaide Yerkes. Two days later when Harvey was detained by Policeman Cornelius Glynn, the burglar put on his best cultured act. “Is it not possible for you to be mistaken in your identification? I never committed a felonious act in my life,” he said. “I protest against this outrage. You must have something more than mere surmise on which to take me into custody.” When that tactic did not seem to be working, Harvey pulled a razor and lunged at the officer. He was arrested and among the pawn tickets in his pockets was one for the silver basket which he pawned for $30. “Nearly all the articles were pawned in the name of Yerkes,” reported The Times. Even though Charles and Mary were essentially estranged—he spent most of his time in hotels—he kept her in high style. When Emily Grigsby acquired a new Columbia Hanson automobile in 1903, Mary got a custom vehicle. “One of the handsomest of the electrics ever built is the special Victoria, owned by Mrs. Charles T. Yerkes, of No. 864 Fifth Avenue,” said Automobile Topics. 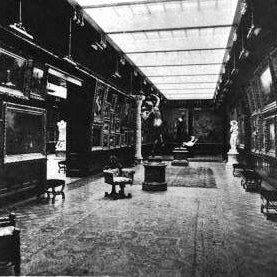 By 1904 Yerkes’ art collection had become so great that it required a separate building. The millionaire purchased the mansion next door at No. 860 Fifth Avenue and filed plans to convert it to a gallery. On April 21 The New York Times reported that “The house will be converted into a one-story building, 40 feet front, 100 feet deep, and 41-1/2 feet high, with a façade of carved brownstone and brick. The interior is to be finished in carved marble, decorated with ornamental columns to harmonize with the Winter garden which it will adjoin. It is to have ornamental doorway opening into the present picture gallery.” Two art gallery annexes, one to the rear on 68th Street, and one replacing the mansion next door at No. 860 held Yerkes' massive collection -- photo Library of Congress Architect Henry Ives Cobb designed the annex which cost $20,000—or about $425,000. 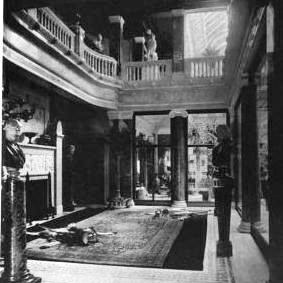 Shortly thereafter a second gallery was added to the rear of the mansion on 68th Street, also designed by Cobb. The gallery was a virtual museum Yerkes would not enjoy his new art galleries for long. Before the 68-year old traveled to London in 1905 with Emilie Grigsby he discovered that Mary had found a paramour—a 29-year old fortune hunter named Wilson Mizner. Prior to his voyage, Yerkes pressured Mary for a divorce and tried to get her to leave the mansion, threatening to leave her out of his will. She refused but was left seriously concerned about her security. New York society waited to hear if Emilie would be beneficiary to any of Yerkes’ millions. But Yerkes had died before he had time to change his will and on January 3, 1906 the terms were publicized. The will, according to The Ottawa Free Trader on January 5, “leaves practically all the vast estate, estimated at $15,000,000, to Mrs. Yerkes and the two children for their life use…After the death of Mrs. Yerkes the family home and its magnificent art collection, supported by an endowment of $750,000, becomes a public gallery.” The newspaper added “Whatever provision was made for Miss Grigsby…if any, evidently was made by gift before the magnate’s death. It is reported that Mr. Yerkes, only a few days before his death, gave Miss Grigsby a check for something like $250,000, which was dated ahead, and therefore is worthless, as the magnate died before the date of the check.” Emilie Grigsby, however, had nothing to worry about financially. Charles T. Yerkes had left her quite well taken care of. Before long Mary realized that Mizner was only after her millions and shortly after the wedding she told a reporter “Just another idol shattered. That’s what all this money has done for me. Robbed me of all my real friends, made me doubt them all, suspect and fear them.” She divorced Wilson Mizner in May 1907 and arranged to take back the name Yerkes. Even with Wilson Mizner out of the house, Mary’s life did not get easier. Days after the divorce, Joseph D. Redding appeared. Redding was the lawyer Mary had hired in 1904 when her financial security seemed tenuous. The lawyer was retained to “obtain for her a share of the property of Yerkes including a share of his bonds, stocks, and all securities.” He claimed she agreed to give him twenty percent of whatever she received. Then, the day following Charles Yerkes’ death, he received a letter from Mary dismissing him. Redding now brought suit against her for his twenty per-cent commission. Once again Edward Roshing found himself under arrest and, once again, Mary Yerkes was without a ride home. She asked Lt. Noble to send a policeman with her chauffeur so he might drive her home before being arrested. Despite her pleas, she was compelled to send to a nearby garage to hire a driver to take her home in her car. Mary’s greatest problems were to come. The will was contested. Later The New York Times explained “When a division of the estate was attempted, the widow maintained that the Fifth Avenue house and the art collection was her property under deeds of assignment made by her husband. This was not upheld by the probate courts of Cook County, Illinois, where Yerkes had his residence.” Mary was forced to give up the Fifth Avenue mansion and the art collection, all of which was sold at auction. An advertisement in the New-York Tribune on February 20, 1910 listed part of the “very important collection of exceedingly valuable ancient and modern paintings.” Included were works of art by Rodin, Houdon, Falconet, Boucher and Van Loo. Antiques included Renaissance and Flemish tapestries, Persian rugs of the 15th and 16th centuries and paintings of the great masters. There were four Rembrandts, four works by Franz Hals, and paintings by Boucher, Breughel, Holbein, Raphael, Rubens Watteau and many others. The auction lasted for days and newspapers reported the staggering amounts paid for rare items. A sword owned by Oliver Cromwell and dated 1650 sold for $1,500. A life-sized bronze sculpture of Diana by Houdon brought $51,000; two Carrara marble sculptures by Rodin were purchased by an anonymous donor as gifts to the Metropolitan Museum of Art including this Baghdad carpet. If Manhattan’s elite never passed through the Yerkes doorways for social functions, they did for the sale. Among the buyers were Mrs. Cornelius Vanderbilt, Mrs. Cooper Hewitt, Seth Milliken, Mrs. Harry Payne Whitney, Mrs. Herman Oelrichs, and Mrs. Samuel Untermyer. Charles T. Yerkes fabulous mansion became home to Louis Terah Haggin. 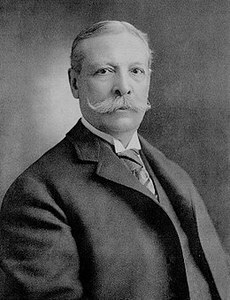 Haggin had started out life as a lawyer; but with the death of his father in 1914 he took over the presidency of the Cerro de Pasco Copper Corporation. Of his father’s $20 million estate, Haggin had inherited nearly $4 million, which was quickly increased with the directorships in other companies he took over from his father. The widowed executive lived alone in the massive mansion with his staff of servants. His daughter, Eila, who was married to Robert Tittle McKee, lived nearby at No. 136 East 79th Street. A tireless worker, he was still going routinely to his office in 1929 at the age of 81. In the middle of March that year, however, Haggin contracted pneumonia. He was confined to his bed in the mansion for ten days until he died there on March 26.